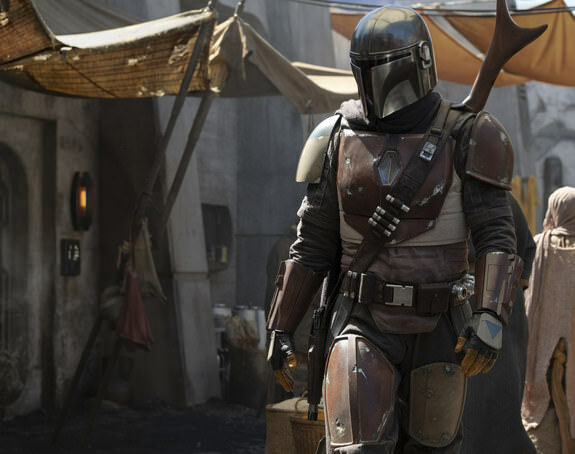 Disney may have decided to slow down the Star Wars films but they are continuing with Jon Favreau's TV series called the Mandalorian. The Mandalorian seems to be going after something of Western gunfighter on the edge of civilization vibe. Disney says The Mandalorian will, "follow the travails of a lone gunfighter in the outer reaches of the galaxy far from the authority of the New Republic." The series is set in a time period between Return of the Jedi and The Force Awakens. As part of NYCC Disney has released the first image from the series which shows a Mandalorian warrior with a rifle strapped to his back striding down a Star Wars market. So far the Star Wars fan base has been very positive about the project. The series has Jon Favreau as its executive producer and writer and variety of Director set for its first series of episodes. Directors include Dave Filoni (Star War animation fame), Deborah Chow (Jessica Jones), Rick Famuyiwa (Dope), Bryce Dallas Howard (Solemates), and Taika Waititi (Thor: Ragnarok). We will release more info on the series, trailers, images, and more as they become available. Currently, the series seems to have a positive reputation among fans, many of whom were turned off by the deconstructive style of Star Wars: The Last Jedi. Industrial Light & Magic (ILM) is expanding its offering of best-in-class visual effects and animation services to include the streaming and episodic television market with a new division: ILM TV. The division will be based out of ILM’s new 47,000 square foot London studio and supported by the company’s global locations in San Francisco, Vancouver and Singapore. ILM TV will offer producers and showrunners access to Industrial Light & Magic’s legendary VFX talent, infrastructure and technology combined with a fresh approach to visual effects, designed to suit the condensed production schedules and rapid turnaround times that episodic series and online streaming programs demand.